I discovered Shito sauce some moons ago. Did I like it then? hmmm not really. it was a little tasteless, or I may have not understood the taste. 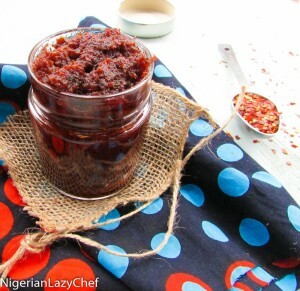 Shito is a Ghanaian sauce which I literally use for everything since I started making it. I could say with confidence that Shito is to Ghanaians what Agoyin sauce is to Nigerians. blend 1 onion with the plum tomatoes; along with the ginger, habanero (if using) and garlic. Heat a pot with the oil, add the cloves(if using) and fry for a few seconds to release it's flavor. Add the onion to the pot. Sauté until brown but not burnt; then add the tomato paste. Fry for a few minutes; then pour in the blended mix and fry until most of the oil has floated to the top. Add the paprika, chili flakes, dry fish powder and dry crayfish powder. Check for seasonings while you fry. Continue frying while stirring constantly. The sauce will begin to turn dark brown or a dark red color until it has turned completely....once the sauce turns color and it looks a little dry, remove from the heat and let it cool(you could remove excess oil at this point). Store in a jar and use as a condiment for any dish. 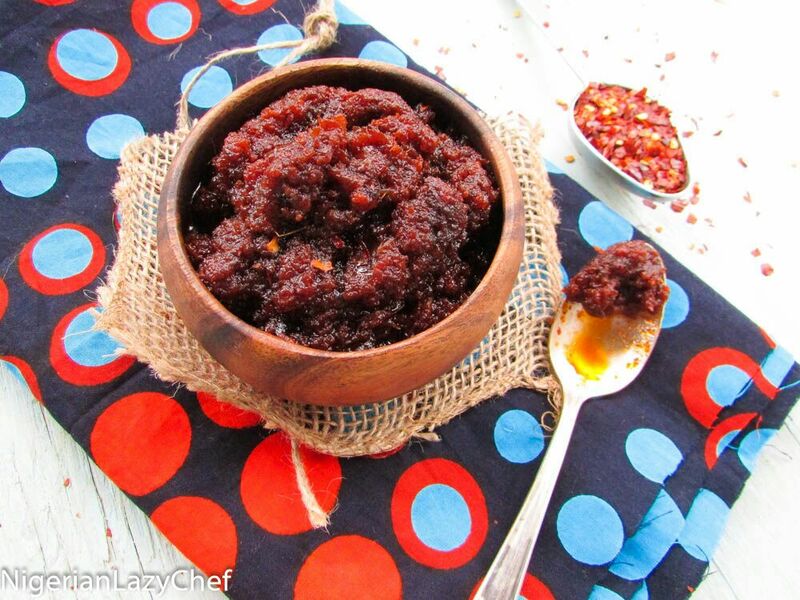 This entry was posted in Appetizers, Sauces, Side dishes, Sides, Small chops, Soups, stew, Stews, Uncategorized, Yam dishes and tagged Ghanaian pepper sauce, Ghanaian pepper sauce recipe, Nigerian food blog, pepper sauce, pepper sauce recipe, Shito, Shito recipe. aces! now have a good dip for my chips and corn fritters. Can you preserve in the jar in the cupboard or does it go in the fridge. How long does it keep for? Thank you Chinwe. I didn’t use palm oil. I used regular oil. I hope this helps. Oh geh!! The only things that are wet that goes in shito are the onions and ginger everything else is dry. No tomatoes in shito. Dry pepper, shawa ( dry fish), crayfish, ginger and onions. Thee more onions and cray fish the sweeter the shito. Add salt and maggi to taste. I know you tweaked but hope you have this as an original recipe. Yeah that’s exactly how my mom makes it some people do add tomatoes though. It definitely changes the taste. I personally prefer it without. Shito can last up to a year if it’s made correctly and it doesn’t need to be stored in the fridge. It’s why a lot of boarding school students like taking it to school in Ghana. I’m a Ghanaian and when my mother makes shito, it can last up to 5 months without it ever spoiling. The key to a good shito is that there shouldn’t be any water remaining in it.